The Southern Arizona Summer engulfed us last June, like like the fiery blazes of hell! 120 degrees for days…100+ for a month. The only thing that kept us sane was looking forward to the cooling rains of the Monsoons, officially declared to start on June 15th. Sometimes- I think last year, in fact- they started early. 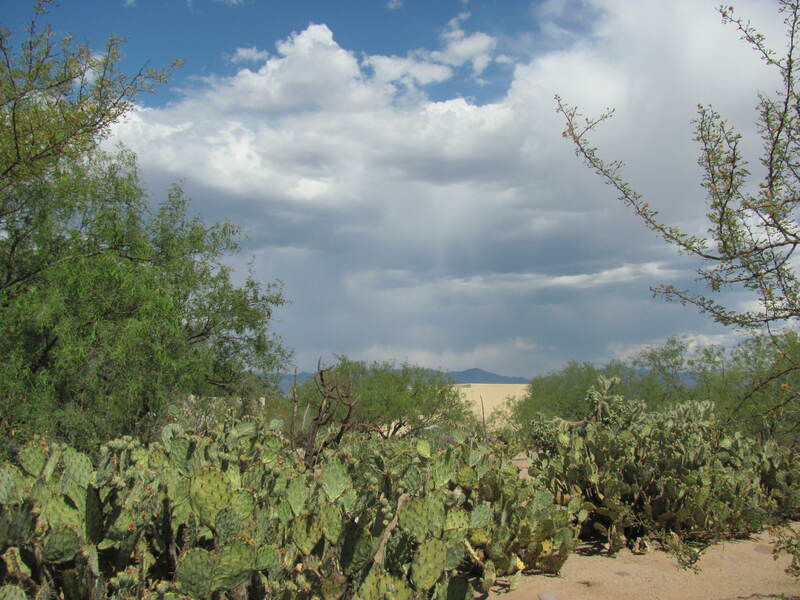 We were hoping the same this year, we desperately needed the rains…the desert was dying! We thought this poor agave was a goner! June dropped off the calendar-still with no rain.We started feeling like the cactus! But, the 4th of July would be here soon, and we ALWAYS get rain on the 4th!! However, independence day came and went with only the booming of fireworks- not the booming of thunder we had counted on. Aaauuuuughhhhh the agony! Todd even went to the extremes of putting sprinklers in the yard on some of our cactus to try to salvage some of them! Something he had never had to do before. We noticed some of our neighbors were doing the same. It wasn’t until about a week after the 4th, that Monsoon finally arrived! As we watched the lighting streaked clouds come rumbling in, Todd stationed himself on top of the shed to act as a human lightning rod…. Here’s a little taste of the desert monsoon…. An no…Todd was not still sitting on the roof as I shot this! I wish I could share the smell the rain drenched desert and feel the cool mist floating in the air. A mist that’s created as the rain dances on the parched desert ground. There is nothing like it! The temperature generally drops from 100+ to about 75 in a matter of minutes! The relief is almost euphoric! Since then, over the past month, it has rained, and rained- one of the best Monsoon seasons we have had in years! Todd has marked over 7 inches of rain so far! Most of the plants that melted with the heat, rebounded! Here’s the heat ravaged agave- unbelievable that it came back to life!…. Heard a little thunder….but still, no rain! 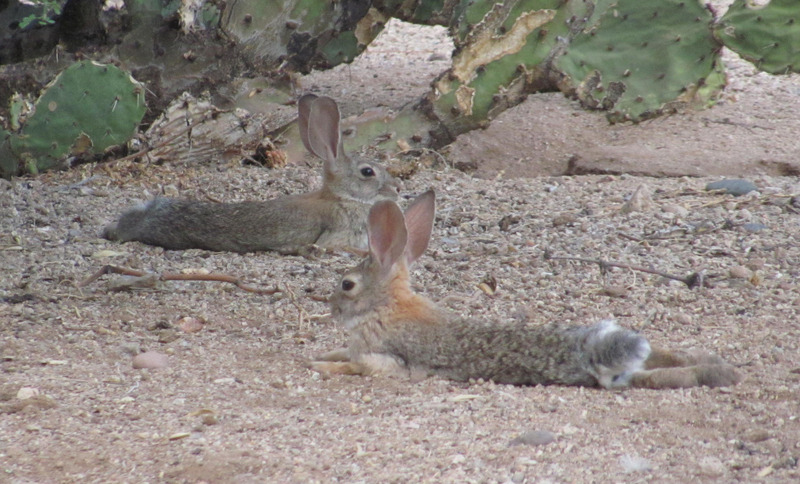 Everywhere you look, the rabbits are stretched out, under the cactus, in the dirt,trying to get at least a little relief from the parched ground. Once the rains come, this will be prime rabbit real estate, as the ground cools off. 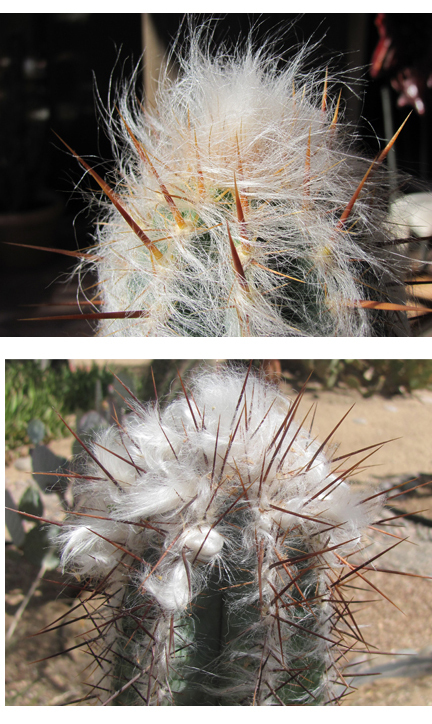 The once silky ‘old man’ cactus is really getting frazzled baking in the sun! Hopefully the moisture will restore his fluffy ‘do! 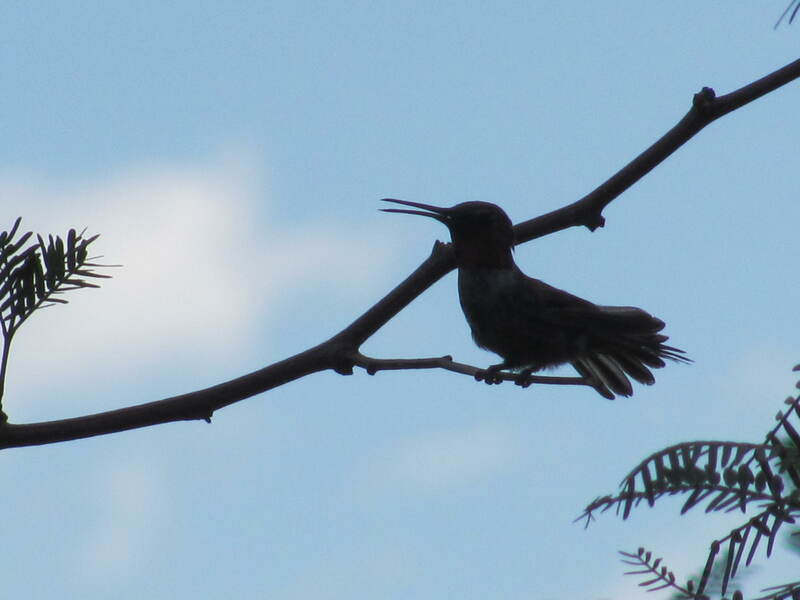 Waiting for the monsoons, the hummingbirds are resting more often. Usually with their little beaks open and wings fanned out, to cool down. They may also be resting up to save their strength, so they can endure the violent storms to come! 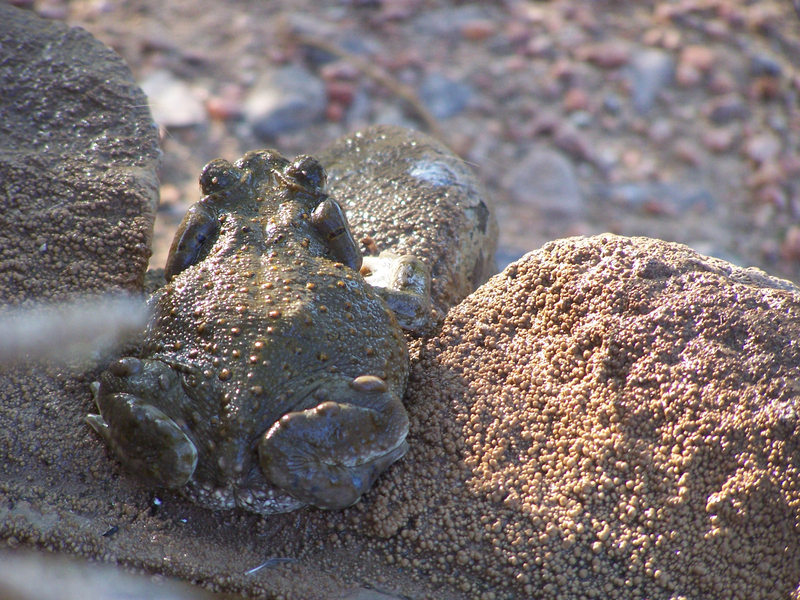 The Colorado River Toads- they hibernate underground all year until the rains come, then watch out! Sometime around August it’s likely to become Toad’s Backyard! And our feathered friends are unphased! Late this afternoon, at 5 o’clock pm, I gathered my camera and a cold beer and ventured out to the porch to see if I could catch any entertaining activity in Todd’s Backyard. 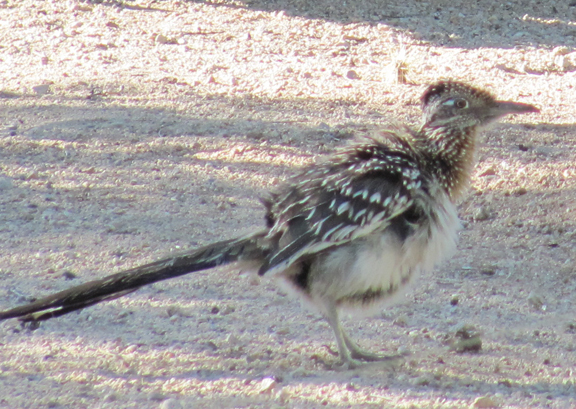 Even though it was like sitting in a blast furnace, the desert critters were still out doing their thing! I thought about going back inside to the nice air-conditioned house and watch some news. 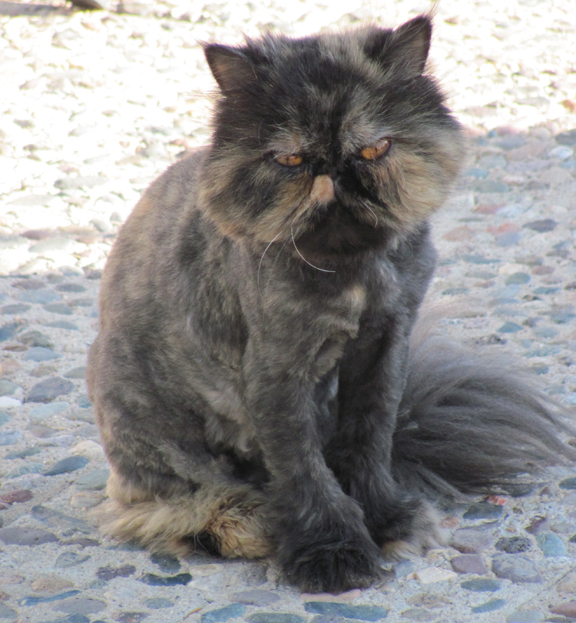 But, as I watched all my little feathered and furry friends go about their business, I couldn’t help but feel a little in jealous of their tolerance of the intense desert heat! So I figure, if they can take it, so can I! So, I settled in to watch the late afternoon routine unfold. 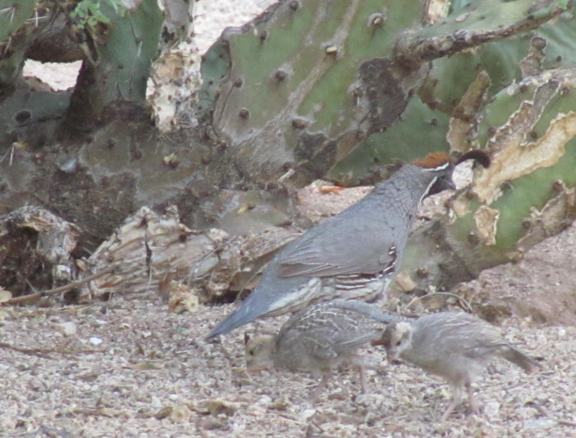 Heat or no heat, I always look forward to seeing this little quail family every afternoon. The family consists of 3 babies and a Dad. The mom must have met her end. What’s really special about this group, is one of the babies is crippled…he has a gimpy little leg and hops along after his sibs and dad. The dad always patiently waits for his little hop-along baby. And under Dad’s watchful eye, they make their rounds. Todd got a new feeder yesterday. 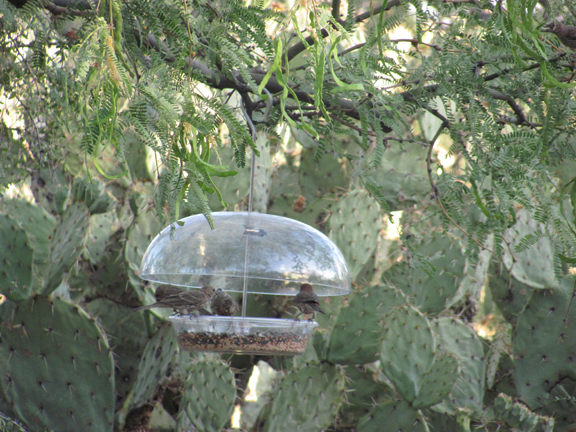 A feeder that the big white wing doves can’t get into and eat all of the seed. Tonight smaller birds checked it out and giving it their whole-hearted approval! 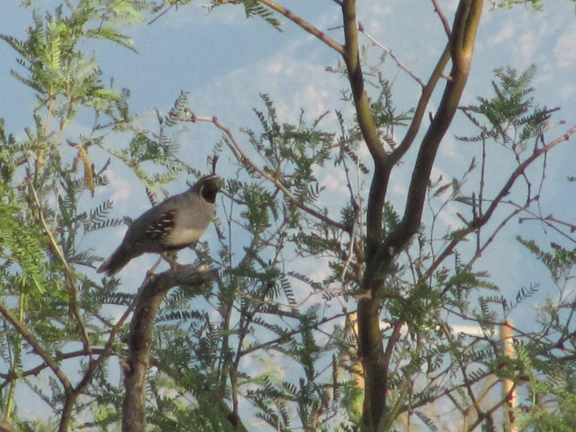 This poor quail is still looking for a mate !….Every night, without fail, he finds his post and calls out for his long-lost love. We hear his ka-kaw! ka-kaw until the sun goes down! 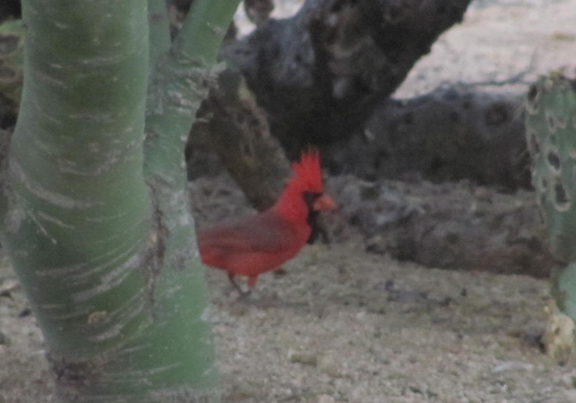 Mr. cardinal found a nice shady spot to catch a little dinner. 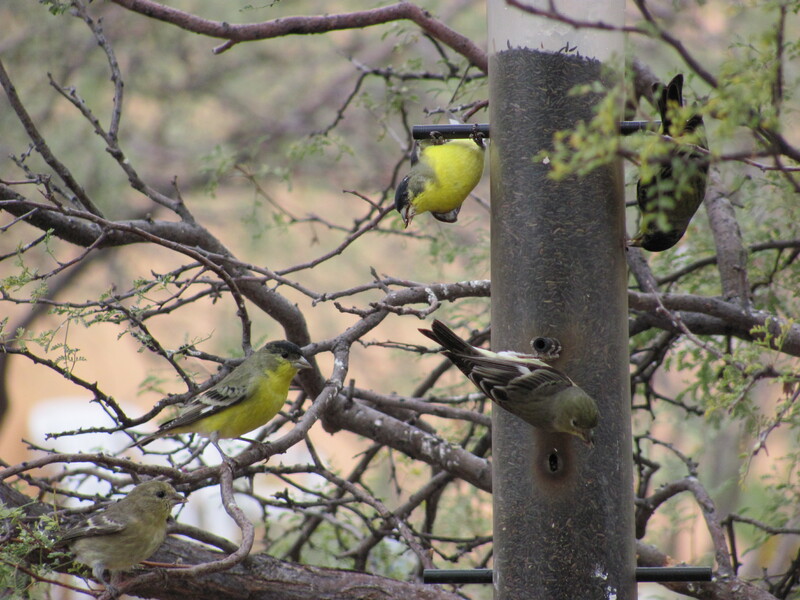 The finches flocked to their 5 o’clock feast! 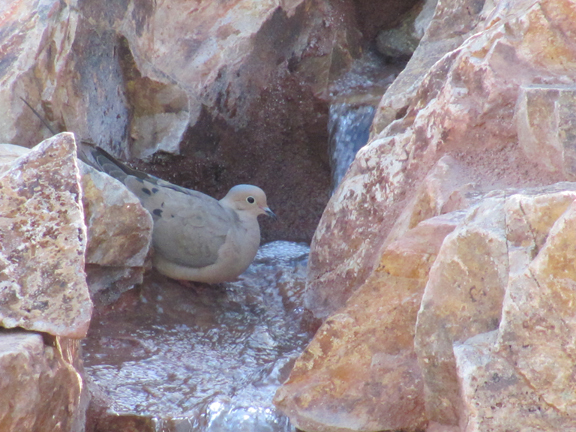 And the dove found a nice cool drink! So, by about 6 o’clock, the thermometer had sunk to 100, I had consumed a few more cold beers and life was good! And tomorrow, when once again it’s 105 at 5, it will be another amazing day!…Sweet!…..I mean Sweat! It finally hit 100 degrees last week. All the spring time blossoms have shriveled up. Summer is finally here! It’s 9 o’clock in the morning and the air conditioner kicks on… It’s the time of year when we already start looking forward to cooler days of the winter to come. 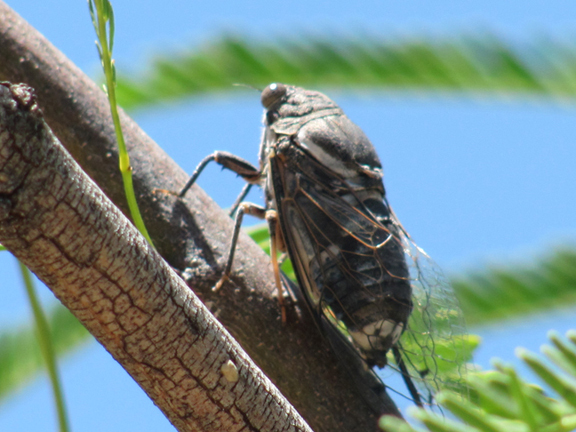 With the heat comes the buzz…not only from the gallons of refreshing sangria that will be consumed, but from these little guys..
You know it’s summer when the cicadas start buzzing. They really get going when Monsoon season starts around the first of July. 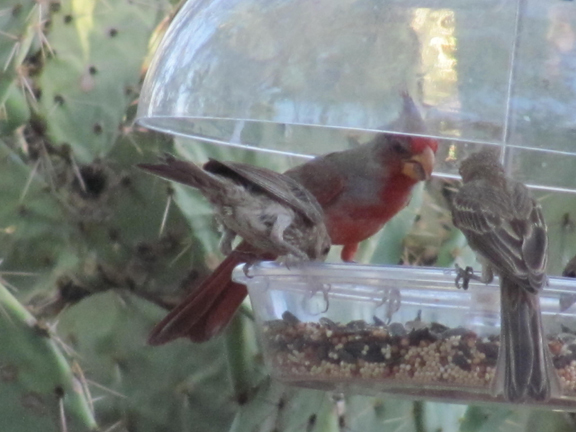 The heat tends to ruffle the feathers of many backyard residents. Puffing up to catch any breeze that might give them a little relief. Or, some just hop in Todd’s ‘water feature’ to cool off! This is likely to be a popular spot this summer! Zoe gets cool with her new summer do…. 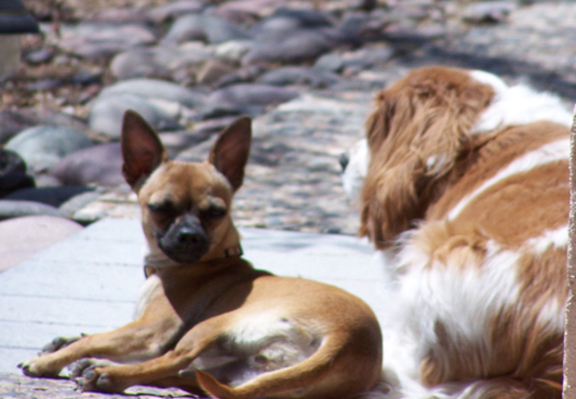 And Lulu soaks up the heat with her desert ‘chi-yotie’ zest for the sun! 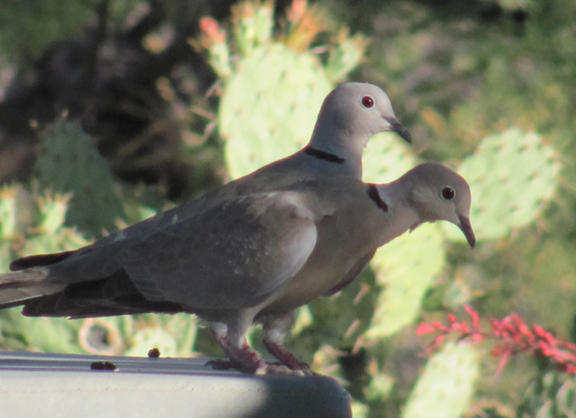 With these two turtle doves hanging out to remind us the holiday season will be here before you know it!